What makes this cookie recipe unique is not only is it extra soft, thick, and chewy, but it is a perfect basic cookie dough to add in any combination of mix-ins that you or your kids LOVE! Anything from chocolate chips, sprinkles, or even berries and nuts can be added for your perfect cookie! I am so thrilled to continue my Thick & Chewy Cookie series by partnering with Country Crock® to sponsor this post. I can’t wait to share my recipes and memories and this delicious new cookie recipe with you! If you have been around here long, you probably know I have a serious love of cookies! Of all my memories growing up my favorites are almost all in the kitchen with my mom. I can’t remember a time when I asked to make something that she said no, instead we were huddled side by side in our kitchen working together, laughing, being creative, licking the bowl and making memories. I can’t tell you how much I love doing the same with my own kids now! I once heard a speaker talking about how to raise children who turn into people you are proud of, and his biggest piece of advice was “Spend twice as much time with them and half as much money on them.” Wow. This really hit me in the heart. How simple, yet how powerful. Sometimes it is hard to come up with things to do with them each and every day, but no matter what all of my kids always love to be with me in the kitchen so we find ourselves baking quite a bit. Not only is baking a great activity to foster natural conversation and connections, but it also sparks creativity and introduces basic math and reading skills. It is one of those super powerhouse educational things that doesn’t seem like work at all! What we are ABSOLUTELY LOVING lately is the Country Crock® Make It Yours™Cookie Recipe. It makes a basic cookie dough that lets you add whatever your mind can dream up to the dough to give you limitless options for cookie flavors! My favorite part is that I can make the dough, then split it into two or three parts and let each of my kids be creative and create their own signature cookies! There is no taking turns, this recipe just lets it be all about them! They get to have fun, be creative, and create a cookie all their own that they can be be proud of. Oh and did I mention that these cookies are good? Like seriously good! Me, my kids, and all my neighbors agree. I can say this with confidence since we made them during my littlest’s nap then took them outside to share while we played on a beautiful afternoon and they were gone in about 3 minutes flat! 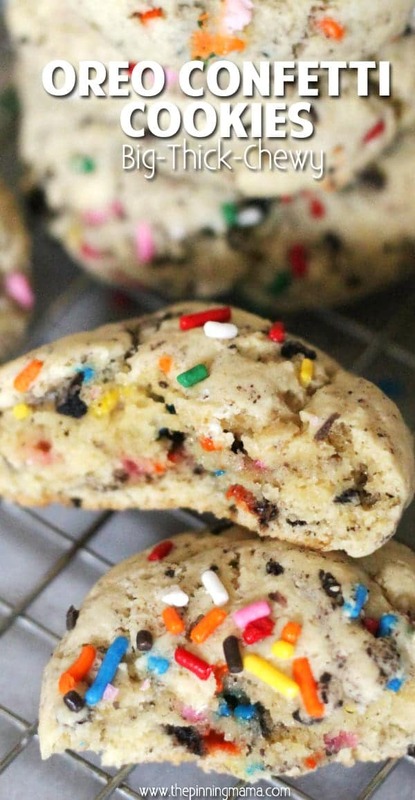 My favorite flavor we made was Oreo Confetti Cookies so I am going to share that recipe with your below! This recipe comes together like a basic cookie recipe- Mix the buttery spread, sugars, eggs and vanilla together. 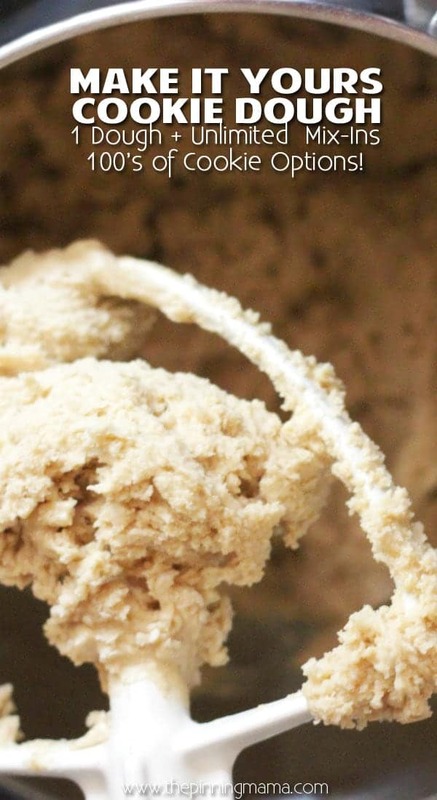 Combine the dry ingredients then pour them into the wet ingredients and stir until everything is well mixed and you have a nice thick and creamy dough. TIP: I love to use Country Crock in cookie recipes. Since buttery spread has a higher melting point than butter, when you put the cookies in the oven it gives them more time to cook before melting so they keep their shape better and most importantly, stay thicker while baking. I LOVE my cookies thick, soft and chewy! If you do too, make sure to check out my other Thick & Chewy Cookie Recipes! Tip: If you are making multiple flavors (for multiple kids) like me, you can split the dough into halves, thirds, or even quarters. The recipe makes about 4 dozen cookies total so there is plenty to split it up without having to double the batch. Just split the amount of mix ins equally and you will be ready to create. Drop the dough on a cookie sheet by rounded tablespoonfuls and bake at 375˚F for 8-12 minutes or until they are just set in the middle. Take them out of the oven and let them cool for a minute or two, then move them to a wire baking rack to cool. TIP: To make sure the cookies are super soft and chewy, keep a good eye on them at the end of the baking time. You want to remove them from the oven when they are just set in the middle, not golden brown all over. I usually can tell because the cookie looses it’s “shine” as it bakes, so when the center is no longer shiny it is ready to take out. They continue to cook after you take them out of the oven so if you wait to remove them until they are golden brown all over, they will often be more crunchy then chewy in texture. Grab the Make it Yours™ Recipe below, or scroll down to grab the recipe with our add ins for Oreo Confetti cookies! We made a few varieties but our favorite from this batch was my daughter’s creation filled with Oreo cookie crumbles and sprinkles! Once the kids create their cookie they then they get to give it a fun name and this one was dubbed the Oreo Confetti cookie! Yum!! I mean seriously… are you not drooling?! Because I am! One of extra thing we did making these cookies was since the cookie crumbs make the dough a bit thicker we were able to handle it easily, so we scooped the rounded tablespoonfuls then rolled them into balls with our hands. This made the final baked cookies a really perfect shape and extra thick, just like we love them! Also, we added a few extra sprinkles on top to make sure they were extra colorful since my daughter loves all of the colors all the time! That step is optional but does make them really pretty. For more great recipes and ideas make sure to follow Country Crock® on Instagram and Facebook! 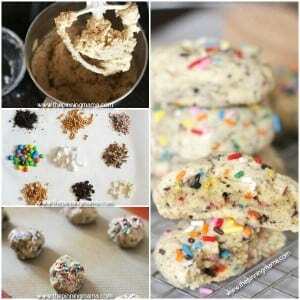 Add cookie crumbs and sprinkles, and mix until every spoonful of dough has some of the delicious mix-ins. Bake 8 to 12 minutes until edges are lightly golden. Cool 1 minute on wire rack; remove from sheets and cool completely. I think my biggest challenge with cookie dough is not eating it before I can get it into the oven:) Great to have a versatile base recipe that you can adapt for various occasions and tastes! I wanted to know what would happens if you use real butter? Made these tonight with my 12 year old daughter, she wanted to make her own cookies so i gave her a 2 cup measure and let her at it. She added some semi sweet chocolate chips, white chocolate chips, mini marshmallows, and broken graham crackers. She rolled them into bigger balls so only got about 2.5 doz cookies but they taste great! Going to to make again with poppy seeds and lemon rind or white chocolate and cranberries! So many options…. I’m so glad I found your recipe! I’ve got so many mix in ideas that I might not get through them all. Today’s batch gave us chocolate/marshmallow, ginger as well as sprinkles. My son wants lemon next time, so that’s on the list. That sounds so delicious! I love that you freeze them for easy to make fresh cookies. That is so smart!